Your roof is crucial for the structural integrity of your entire home. Unscrupulous, rogue roofers rely on this to execute scams and fraudulent activity. So-called “storm chasers” wait for periods of severe weather, then descend on unsuspecting homeowners to warn of roof damage. These opportunists prey on the vulnerability and fear of good people to make a quick buck, and they’re not bothered by hurting others in the process. Protect your property and financial interests by knowing how to spot foul play at your doorstep. Here are some tell-tale signs that you may be dealing with a rogue roofer. Always be wary of dealing with roofers that turn up at your door unannounced. While some reputable roofers will canvass neighborhoods, proceed with caution. With rogue roofing contractors, this usually happens after a big storm. They may warn you of potential damage; sometimes, they’ll invent damage to scare you. After a spell of severe weather, contact a local roofing contractor with a reputation in your community. Many storm chasers do not have roots in your community and are from out-of-state. When they’ve drained the storm-damage work out of your local community, they’re gone, leaving behind unsatisfied homeowners and roofs installed with subpar materials and craftsmanship. In other words, the absolute best thing you can do is speak with roofing companies who aren’t just the fly-by-night type, but instead who have invested in their communities and proven themselves to be trustworthy. As well as knocking on doors just after a storm, there are several signs of a roofing scam. For example, rogue roofers often try to use fear and anxiety of what might happen if you don’t hire them on the spot. Once they’ve succeeded, they pressure homeowners to agree to an expensive repair job there and then instead of giving the customer the opportunity to shop around. There are several signs that a rogue roofer may be trying to obtain cash under pretenses. For example, they will often speak rapidly as a ploy to confuse you. They may warn of the potential consequences of not paying for “essential repairs,” sometimes without assessing your roof closely. Professional roofers never play on the fear and anxiety of homeowners. They offer solutions and reassurance. They calmly investigate before relaying the facts in a clear and dispassionate way. Reputable roofers know just how distressing property damage can be, so the last thing they want to do is increase your anxiety. You likely know the type, and the solution is always the same–don’t give in to fear; instead, consider your options and make the wise decision. A common tactic involves initially quoting a high price for repair work. If the homeowner appears hesitant or dismissive, the storm chaser might stage a phone call to their manager to see if they can negotiate a better deal. This tactic is used to show to the potential customer that everything is being done to bring the price down and that the roofer will fight for you to secure a better price. What’s happening, however, is a staged conversation with a fellow rogue roofer. Often, this is all part of the theater. Rogue roofers often have a price worked up the moment they step onto your property. By staging a phone call for a one-off discount, they’re creating the illusion of special treatment. A hasty estimation process should always arouse your suspicion, as should any estimate provided without a thorough inspection of your roof and a review of aerial measurements and photography. This fast roof estimate can differ from a roofer who thoughtfully gives you an approximation, or “ballpark” figure, before taking the time to prepare a formal proposal. Roofers who have been estimating roofs for a long time may generally have an intuitive sense of pricing work close to exact figures. Sometimes, however, the rogue roofer will have decided how much they want for the job before they knock on your door based on the potential insurance payout. 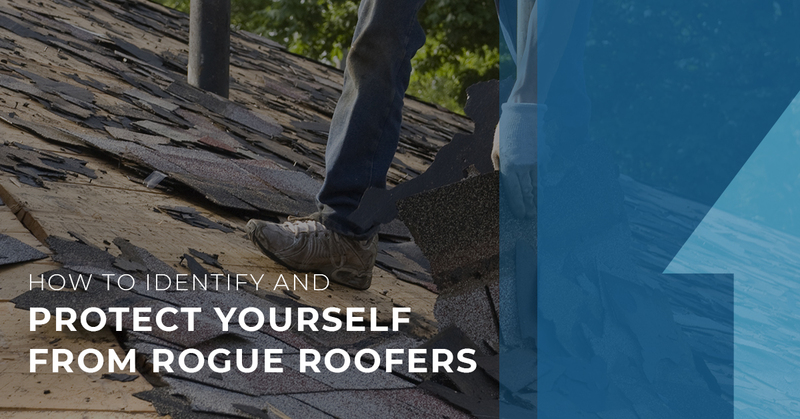 You’ll likely be able to tell based on how quickly the rogue roofer throws out a price, if they write down any calculations, and if they take the time to thoughtfully consider the measurements, the style of your roof (gable roof or hip roof, for example), as well as your product selections. Yes, the average cost to replace a roof varies depending on the specific situation, but getting a precise estimate for your roof is the way to go. For insurance work, a rogue roofer may tell you that they’ll cover your deductible to win your project. Covering insurance deductibles is illegal under Minnesota law and is one reason roofers can be cited or have enforcement actions by the Department of Labor and Industry. Roofers who ask for your insurance paperwork and write an estimate for the same amount as the adjustment may be angling for a large profit and don’t necessarily have your best interests in mind. Instead of using the best brand and quality of materials within the scope of the insurance paperwork (at a higher cost to them), they may use substandard materials and practices to lower their job costs and reap a hefty profit on the backs of you and your insurance company. Withhold the insurance paperwork and payout amount from the roofer and ask them to estimate it as they would a non-insurance roof replacement. If they appear frustrated or insist on seeing the paperwork, be careful. If they complete the estimate using their regular method, their estimate may be substantially lower than the amount your insurance provider will pay. Also, always return any excess funds to your insurance company. Rogue roofers who tell you that you can keep the difference between the amount you pay the roofer and the amount the roofer bills to insurance provider are being reckless and causing liability for you if you don’t return the excess funds. Don’t let an unethical rogue roofer lure you into an insurance fraud scheme. Although it may be too late, there may also be warning signs on the invoice you receive. Be wary of generic invoices and ask for an itemized invoices instead. The rogue roofers usually become overly assertive with loss adjusters. While it’s normal for the contractor to notify the adjuster about additional items that should be covered or included, the rogue roofer will try to add unnecessary, extra jobs to the project to inflate the cost of repairs. It’s a good practice to get at least three quotes for any roofing work before proceeding. Scammers will do anything to stop you from doing this, even intimidating you. They want you to sign on the dotted line right there and then before you’ve seen just how wrong their estimate is. This impatience and pushiness is a tell-tale sign of a contractor without integrity, honor, and respect for hard-working homeowners and is part of a pattern of behavior that often gives scammers away. When it comes to roof installation, make it a point to resist any high-pressure sales tactics. Keep your wits about you, do your homework, and go with the best option. Before discussing roofing repairs, check the company’s website, social media, and customer reviews. Also, verify the organization’s licensure or registration with Minnesota’s Department of Labor and Industry website. It should be current through your entire project. Also, ask to see copies of the roofer’s general liability and workers’ compensation policies and ensure they are in effect through your entire project and that the policy limits meet or exceed the statutory requirement. Sadly, some salespeople in the home renovation industry have been charged criminally for crimes related directly to public safety, finances, or construction. We also recommend asking the contractor for personal background checks for the owner(s) and any sales or project managers who will be working with you or on your project. Carefully consider any recent or repeat alcohol- and drug-related offenses you find. Safety practices are imperative in roofing. Even on a home with a low-pitch, one lapse in judgment caused by drugs or alcohol could lead to someone becoming permanently disabled or even dying from a fall only as high as six feet. One crime in the home renovation industry is “theft by swindle,” which is also called “theft by deception.” Theft by swindle is using any “artifice, trick, device, or any other means” to obtain property, money, or services from another person. It can occur in any sales role but particularly in automobile sales and home renovation sales. Though such criminal convictions may bar the person from obtaining Minnesota licensure in construction, the rogue roofer could be operating behind someone else such as a family member, spouse, or partner who applied for the license potentially to enable the roofer to continue working and to continue with their dishonest conduct. If such a phone call is necessary, a reputable roofer with nothing to hide would have this phone conversation on speakerphone. If any part of this process is kept private, something suspicious may be going on. As long as the manager or approver on the other line knows you joined on the call, there should be no worries about confidentiality. An honest, skilled roofer will estimate a roof replacement’s price based on the actual measurements of the roof obtained through aerial photography, hand-measuring, or otherwise. They will then figure the quantity and cost of product selections to meet the manufacturers’ and code requirements, account for any unique concerns, and then add their markup to specific expenses to achieve an adequate profit margin. While you shouldn’t expect a roofer to provide you with every formula and factor they use to figure their estimates, the roofer should be able to give you a thorough explanation of what is going into the work that needs to be done for your specific project. A trustworthy roofing contractor would never expect you to decide based on a brief meeting with a virtual stranger. Once you have an estimate, tell the contractor that you will be in touch after researching the problem and asking for second and third opinions. It’s always a good practice to get three or four quotes before signing with anyone. Use the time to look for real customer reviews on the roofing company; you’ll find some on local discussion boards, forums, and specialist review sites. Sometimes finding the best roofing contractor can be hard work, but you’ll be thankful that you spent the time on it when it saves you a boatload of money (and plenty of headaches)! At all steps of your project, if you believe the contractor may be using underhanded tactics or is breaking the law, contact your insurance provider (if it’s insurance work), the City Inspector, or the Department of Labor and Industry. Telling a pushy salesperson “no” can be a scary and challenging experience for some people, particularly the elderly and those who live alone. You do not need to worry about confronting a storm chaser, but if you feel uncomfortable dealing with them, ask a friend or family member to be with you throughout the process to offer support. At the end of the day, these people come into and out of your life just like a storm, so don’t worry about seeming rude if you don’t want their services. Reputable roofers don’t ask for your cash. Sometimes, you’ll be asked to pay a deposit, but not until you have signed a detailed project proposal and contract with the roofer showing your deposit and the roofer’s payment terms. Sadly, not all seemingly legitimate contractors can be trusted. Thousands of innocent homeowners are the victims of scams daily, and anyone can fall for them. If you want the work with a reliable contractor where you know that your roof repairs or replacement are necessary and in expert hands, reach out to the team at UpWright Restoration Services. UpWright is a locally-owned and operated family business, and we’re passionate about quality, reliability, and ethical business practices. It’s in our name, and it’s in our hearts. We treat every house as if it’s our own and take great pride in delivering roofing services at fair prices. Roofing scammers damage the industry we love, and we take great pride in exposing their deception and proving that there are still roofing companies who care about getting the job done the right way. At UpWright, we assess your roof and let you decide with no pressure. You’ll always get honesty and openness from us, and if you need time or if we advise that your roof still has some life left in it, we’ll wait for you until you need us again. There are no pushy sales tactics or anything of the sort and we’re glad to take a no just as graciously as a yes. While we’re working day after day to put the rogue roofers out of business, you have nothing to fear if you remain optimistic yet careful and vigilant when working with contractors. Even if you don’t hire us at UpWright to complete your project, we’d be happy to offer our expertise and consult with you for free. Peace of mind shouldn’t cost you a penny, and we’re here to help you in any capacity. Whether potential roofing scammers have approached you and you’d like help or if you want an honest and reliable estimate, contact us today! We look forward to hearing from you.